← 17 January 1862: Upon the whole the President was much irritated and declared if such was to be the course of the States towards the Gov’t the carrying on the war was an impossibility – that we had better make terms as soon as we could, and those of us who had halters around our necks had better get out of the Country as speedily as possible – I have not seen him so gloomy – I wish he was a dictator. Item description: Letter, 18 January 1862, from Malachi J. White to William S. Pettigrew. Throughout 1861 and 1862, William S. Pettigrew was in Raleigh, serving as Washington County’s representative to the North Carolina Secession Convention. During his absence from his plantation, Scuppernong, Pettigrew apparently enlisted a man named Malachi J. White to oversee the work of the plantation. 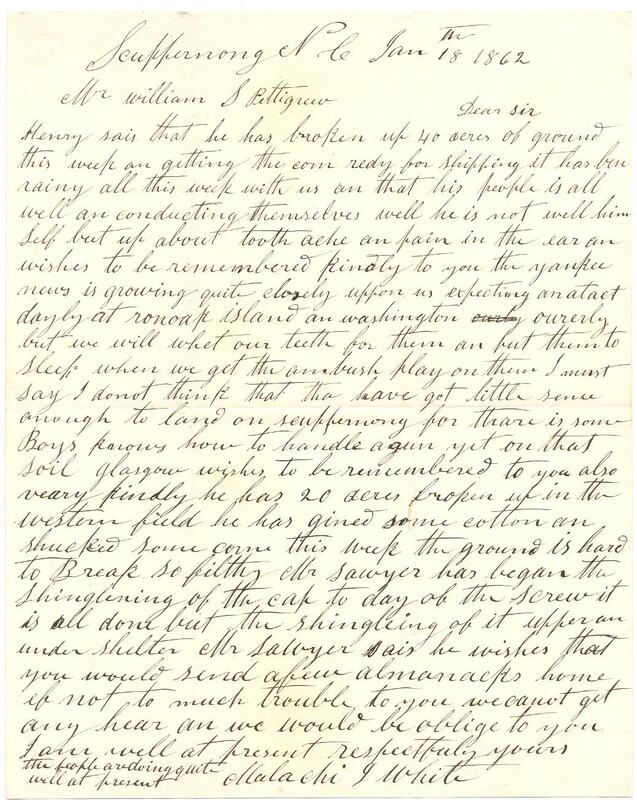 White wrote to Pettigrew frequently to report on the condition of the plantation, the cultivation of crops, and the activities of Pettigrew’s slaves (often passing along messages dictated by them, such as the note in this letter, “Glasgow wishes to be remembered to you also veary kindly he has 20 acres broken up in the western field.”). Little is known about Malachi J. White. An “M.J. White” appears in the 1860 census for Washington County, N.C. Due to the position of the listing in the census and its proximity to known Pettigrew neighbors, it is presumed that this “M.J. White” is the writer of the letter, one Malachi J. White. He is listed as white, 37 years of age, having a personal estate worth $145. His wife is listed (Frances, 27 years old) and there are three children living in the household: Nancy (10), Henry (5), Bailey (4 months), as well as a live-in relative, Elizabeth A. White (39), whose relationship to the rest of the family is unclear. Item citation: From folder 250 of the Pettigrew Family Papers, #592, Southern Historical Collection, Wilson Library, University of North Carolina at Chapel Hill. This entry was posted in Southern Historical Collection and tagged Burnside Expedition, Malachi J. White, North Carolina, overseers, Pettigrew family, Roanoke Island, Scuppernong, slaves, Washington County, William Pettigrew. Bookmark the permalink.